Join us for a weekly bush playgroup program (8 sessions) where families gather to enjoy all the benefits that nature has to offer at Westerfolds Park, situated beside the Yarra River in Templestowe. Our Bush kids program for children aged 3.5 -6 years is specifically aimed at developing and learning new skills through bush crafts, Indigenous/Australian stories and educational bush walks that inspires a develop love and deep connection to nature and encourages the use of gross motor skills through climbing, balancing and building. Eco Explorers bush programs are facilitated by qualified and experienced nature play educators (read more about our team here) that are highly skilled and knowledgeable in the area that they work in. Our Westerfolds Park bush kinder is led by Adam who has been delivering bush programs to families for over two years. He spent his childhood living and camping in the bush; climbing mountains, exploring rivers, learning to fish, track, make fires and to simplify… just ‘being’ at one in nature. 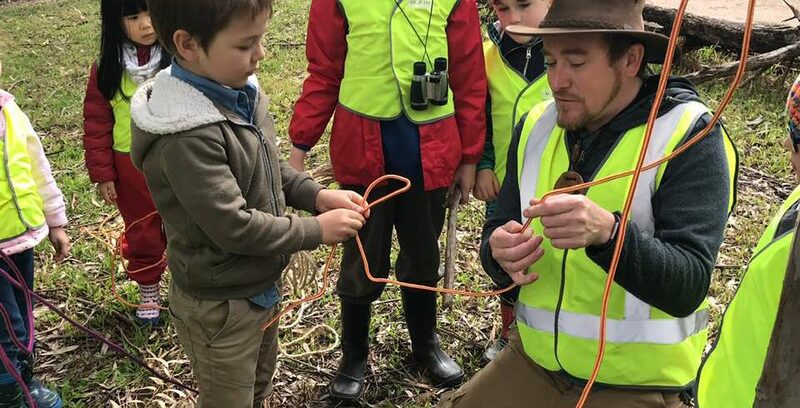 Adam now hopes to share his childhood & adult experiences with the next generation to inspire a deep connection with nature. He has a background in Outdoor Education and is a trained level 3 forest school leader. It’s also a time for parents to disconnect from their busy lives (and technology) and re-connect with their child in nature. This time is as much for you as it is for your child. Our bush kinder bring together a community of like-minded parents who are supportive and welcoming. Bush kinder is an all-weather outdoor playgroup so you need to make sure you bring appropriate weather protection and clothing. Children must have closed footwear when walking in the bush, sun hats, sunscreen, wet weather gear, plenty of snacks and water and a change of clothes. Our session will only be cancelled in the event of an extreme weather warning; fire, storm, high temperatures and strong winds. Ages: 3.5 – 6 years (siblings under 14 months are welcome to attend for free).